Carica papaya, more commonly known as the papaya plant, has an important place beyond just the breakfast plate. Put down that ibuprofen, move aside aceitamenophen. Have a headache? Nature has got you covered. Navigating my way through the UGA Costa Rica San Luis Botanical Garden’s medicinal plant garden alongside several tourists, I came across a tree that had been sliced, battered, and bruised. Someone was clearly out for blood. Would you believe me if I told you this plant isn’t dangerous? The Sandbox Tree, Hura crepitans, its bark in particular, has toxic properties. Stay away, right? Wrong. The kicker is that Costa Ricans once used the tree to harvest food. Here’s how it worked: because the tree is typically found in riparian environments, fishermen used to slice up and grind the bark of the tree, activating and releasing the toxic sap. They would toss the bark into streams to poison fish by way of stunning. The paralyzed fish were then easier to catch, and were killed after regaining consciousness in a bucket and supposedly detoxing, therefore becoming “safe food” for Ticos. This practice of fishing is now banned in Costa Rica, not only because of a direct threat to human health (contact of sap with eyes can cause temporary blindness), but also because the toxic sap is enough to kill other organisms in the streams. Two points, Costa Rica for taking steps to keep your streams clean! Resident Naturalist Gina Gilson leads a tour through the medicinal garden. Her upbeat energy is reflected in the responsiveness of her tour group and the garden is instantly filled with bursts of laughter, oh-s and ah-s, and unending questions. Noses scrunch and eyes widen as the groups use their senses to identify plants she knowledgeably plucks from branches. Waiting for their aha-moment, she giddily munches on a deep purple wild clover. Approaching a thin-branched tree, however, she tweaks her facial expression just enough to hint at a change in the playful pace. She raises her finger and our eyes follow until they meet the angle’s trumpet. Instantly, I sense a deceptive innocence in the pale peach flowers gently swaying overhead. I imagine them to be like delicate bells; faint chimes sounding in my head, beckoning me closer to their subtle, addictive scent – which is particularly stronger at night. Their physical allure alone is mesmerizing, but eating the flower of the angel’s trumpet, genus Burgmansia, has far graver consequences. Gina cautiously explains that eating the blossom – a hallucinogen – induces temporary insanity, a violent high, and vomiting. With her familiar chipper voice she adds that the plant does have a beneficial medicinal property: chopping up the green leaves and steeping them in boiling water relieves symptoms of asthma. The windy transition from the wet to dry season in Costa Rica can easily trigger a craving for a shiver-soothing cup of tea. But while your water is boiling, don’t go skipping off to the medicinal garden with little knowledge of what to brew. Certain plants, although deceitfully uniform in appearance, may have different medicinal properties – and flavors – ones your taste buds hope you never confuse. Take for instance, lemongrass, Cymbopogon citrates, and citronella, Cymbopogon nardus. Both nearly identical, long bladed, bright green grasses belong to the Poaceae family. Their oils can be used in perfumes and as repellents, but the similarities end there. 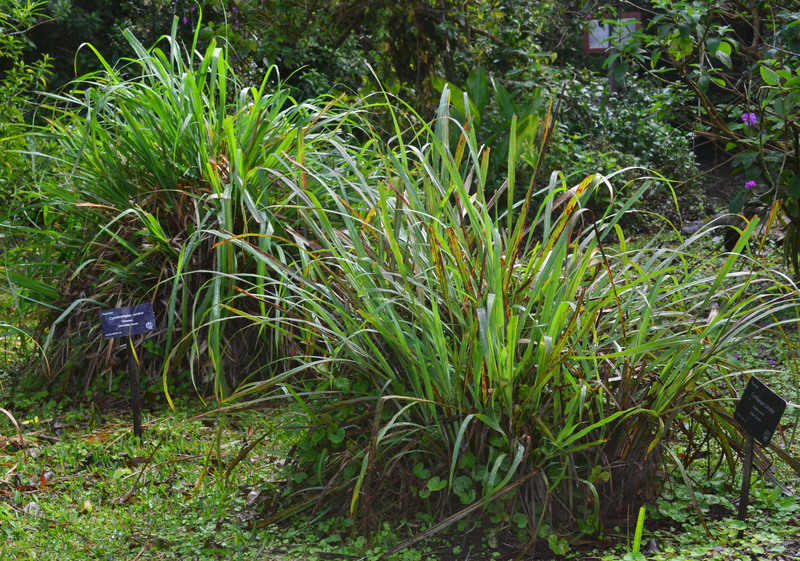 Here, Cymbopogon citrates (front, right) and Cymbopogon nardus (back, left) are pictured together. Visually identifying a plant, and differentiating it from another, can be tricky. An infusion of revitalizing, light lemongrass tea can ease certain conditions including stomachaches, asthma or bronchitis, or cold and flu symptoms. Citronella leaves, on the other hand, produce essential oils that are most commonly used externally as an insect repellent, soap, or household disinfectant…that doesn’t quite sound like my cup of tea. To be sure you’re picking the proper grass for your ailments, test your knowledge with a second sense. Crunch and smell a blade of grass from each of the “twin” bushels. Lemongrass will have a refreshing, lemon aroma, while citronella has a harsh, zesty scent.